This book reveals information the U.S. Government and the Church doesn't want the public to know about UFOs and Extraterrestrial life. 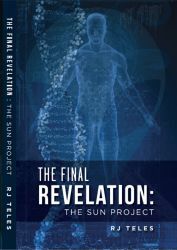 Based on classified information disclosed by high-ranking military and intelligence sources, THE FINAL REVELATION: The Sun Project reveals the real story about the existence of intelligence extraterrestrial life and government interaction, previously unknown secrets regarding Roswell, the truth about alien abductions and some of the most infamous UFO incidents in history, as well as the hidden knowledge the church has kept secret for thousands of years. According to UFO Investigator and Researcher, Michael Pan, RJ and I have worked on a number of UFO investigations together. I am pleased to say that I have not met a person with a more impeccable character. His research has always been diligent and comprehensive. As a researcher myself, I can attest to the difficulty of conducting research in regards to the UFO Phenomenon. Original sources are scarce, and finding witnesses in the government or private sector willing to disclose their actual experience is even more difficult. In this book RJ has obtained both. This is not a dry academic dissertation; rather it is a page turner that will finally shed light on the true story of the UFO phenomena as told by those that worked behind the curtains. I cannot underestimate how valuable this book will be to the UFO community in bringing the truth of what is happening in our skies to light. RJ Teles, M.Ed., has been an investigator and "student" of the UFO phenomenon for almost 50 years and has worked with numerous UFO groups including NICAP, MUFON, NUFORC, and the Center for UFO Studies. During that time he has completed over 300 investigations and numerous interviews with military and government witnesses. He holds a Master's degree in Information Technology Research and Development and worked as a technical consultant on cyber systems security, threat assessment and mitigation, and forensic data analysis for the government and private corporations. It was his work in these areas that gave him access to the military and intelligence communities where he met individuals willing to share their experience in regards to the UFO phenomenon and extraterrestrial life.